The Café de los Angelitos is a not-to-miss for visitors of the capital of Argentina, Buenos Aires. Photo by Gloria J. Chang. You do not have dinner at Café de Los Angelitos in Buenos Aires for the food. You likely will not leave thinking: That was one of the best meals I’ve ever had! You do not go for the wine either; the wine list is very limited. But you must go. For the tango. Tango began in the suburbs of Buenos Aires at the end of the 19th century. 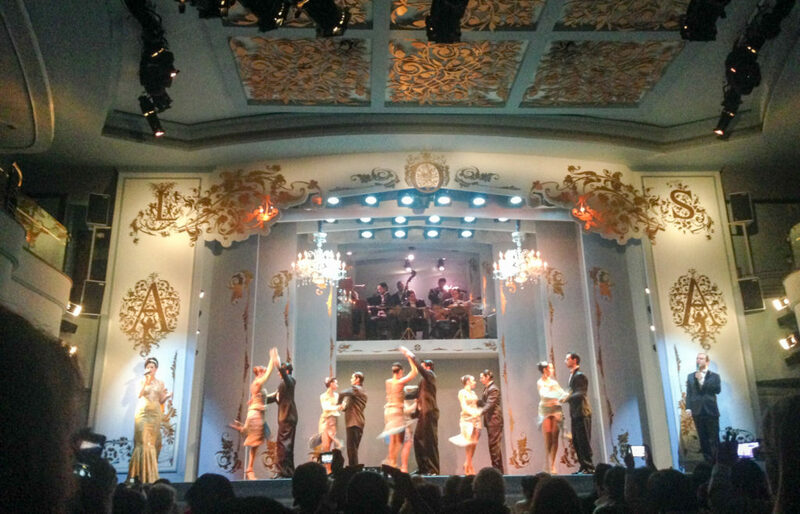 The experience of dinner, wine, and tango in a historic café in the capital of Argentina is a not-to-miss for visitors to this city. A live orchestra plays atop the dancers on the second-floor stage. And it is just gorgeous. Emotional. It may leave you wondering, as it did me – because I am the sort to be curious of such things – why were the female dancers just as tall or taller than the male dancers? How are the men even able to lift the women? Are they going to come crashing down right in the middle of the show? I am told that these more showy aspects of the tango show are not true to Argentine tango, which is more subtle. But it’s a great introduction. It’s a great show. Before or after the show, you’ll want to check out the old photographs lining the walls of this café, whose history goes back to 1890. Also, for dinner, have the steak. You’re in Argentina!